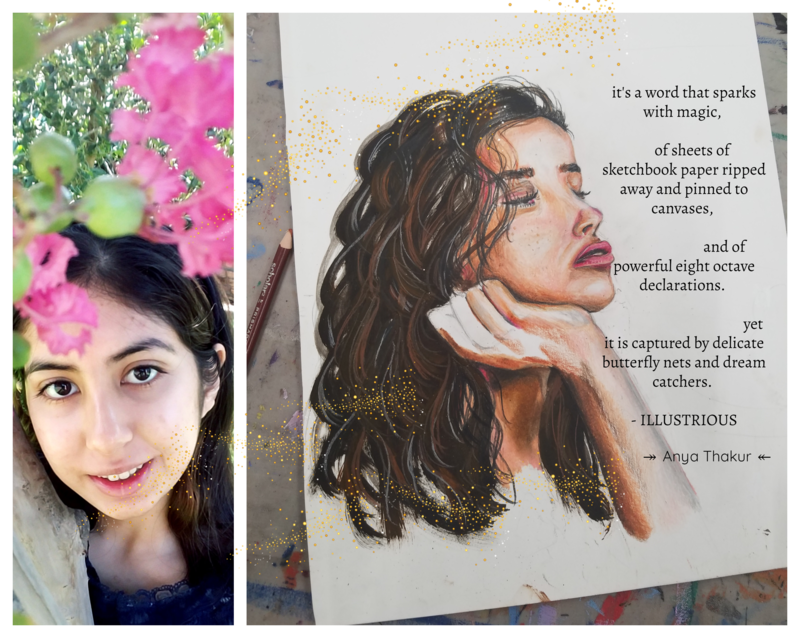 'ILLUSTRIOUS' is a poem written by 14-year-old poet and women's advocate Anya Thakur. ‘ILLUSTRIOUS’ is a poem written by 14-year-old poet and women’s advocate Anya Thakur. She works to empower and uplift communities as founder of GirlUp Dallas, a UN Women organization, and a MetoWe partner with ArtRising, which provides arts enrichment to underprivileged communities and creates diverse programming for South and East Asian women. Hosting education, self-defense, and language and literature classes to empower rural women in Delhi, Mumbai, and Munipur, and humanitarian efforts with Myna Mahila, which empowers women in rural India through health education, her women’s advocacy promotes UN Women’s mission to ensure a fair and equitable future, and she has traveled throughout the United States and India to speak for girl’s education and empowerment. it’s a word that sparks with magic, of sheets of sketchbook paper ripped away and pinned to canvases, and of powerful eight octave declarations. yet it is captured by delicate butterfly nets and dream catchers. my grandfather was illustrious, a chief prefect and now an ex-naval captain, who recieved letters brimming and overflowing with praise from admirals, uniform heavy with medals, who commandeered warships and the respect of all who knew him, and unwittingly and abashedly won the title of ‘most handsome man’ aboard. but i find him to be so because he raised my mother to speak boldly and stand tall at a time when women were told to be silent and paint themselves the color of the walls behind them, and to know her worth and claim her place beside him when she was expected to eat last. because he dedicates himself fully to all he pursues and does the right thing, not the easy thing. because he treats his dog with all the respect and dignity of a human child. sets out a fresh water dish everyday for the pigeons that pause to land on his terrace and bought umbrellas for the maids during monsoon season. reads until his bed is covered in books piled till the ceiling, and tells me the stories of india and recounts all he has learnt. and loves purely and selflessly. he fixes the leaky pipes and the air vents of his modest house for our visit. runs out to buy warm naan breads and mangos from the delhi fruit markets, and grates fresh ginger to mix into cool lassi drinks for us. holds the hands of those who can give him nothing, gives up opportunities to rise for himself to lift my mother up. he lives humbly, knows nothing but honesty and humility. his life may be simple, but it is illustrious to all who know him.